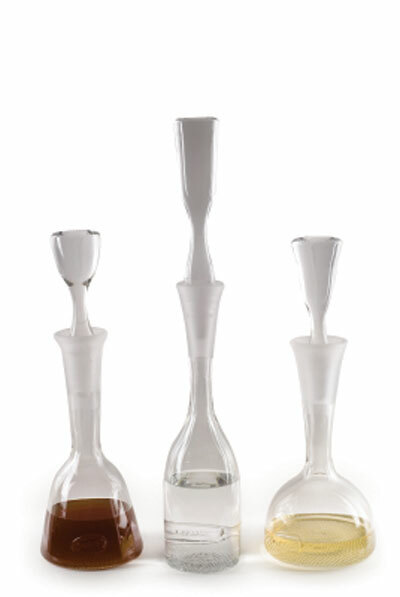 Over sized hand blown glass decanters with solid stoppers. Eco Mission: Using cutting-edge technology to reduce waste and gas consumption. We built two electric furnaces that run up to 10 times more efficiently than the traditional gas furnace, and produce zero Co2 emissions. These furnaces then run on sustainable wind power. Each day, approximately 100 pounds of excess glass is recycled into the smaller furnace. This glass waste is then re-used to produce our eco-products, a new line of 100% recycled, chemical free products. We pack our glass with biodegradable peanuts and re-claimed materials. The quality of our work hasn't changed but our methods have.